Meanwhile Australia wants reduced tariffs on products such as skim milk powder and cold rolled steel and majority ownership of investments in education, tourism and healthcare in Indonesia. Australia and Indonesia have set a November deadline for a conclusion to the negotiations, which began in 2012 but stalled a year later amid diplomatic tensions between the two countries and did not resume again until last year. Chief negotiator Deddy Saleh told Fairfax Media that Indonesia wanted tariffs removed on its textile exports to allow its textile and clothing producers to compete with products from Malaysia and China, which already had free trade agreements with Australia. Although Australia has eliminated tariffs on most agricultural products, tariffs on textiles remain and will not be phased out completely until 2020. A controversial issue is the movement of workers between the two countries. "We requested that Indonesians be able to work in Australia," Mr Deddy said. He said Indonesian hospitality workers reported having their visas rejected despite having experience, training and meeting required standards. "Based on our study, Australia needs nurses, people working in the health sector, cooks, and hotel staff," Mr Deddy said after the ninth round of negotiations in Jakarta last week. "If they are still in need why were we rejected?" The Indonesia Australia Business Partnership Group last year called for a "relaxed and novel visa scheme" that allowed Indonesian and Australian skilled workers to easily move across the border. Mr Deddy said Indonesia would consider Australia’s request to lower tariffs on products such as skim milk powder, which Trade Minister Steve Ciobo singled out as being on Australia’s wish list when he visited Jakarta last month. "We have requested related ministries to consider it but it’s up to them to grant it or not. So it will be decided in the last meeting," Mr Deddy said. We really want to make sure this agreement is seen to be balanced and doesn’t favour one particular country. "I think objectively and commercially it can benefit both parties but it should be balanced, meaning if we request something of Australia it should also be granted." Mr Deddy said Indonesia was also considering Australia request for majority ownership of investments in education, healthcare and tourism: "At the moment we can only grant 49 per cent ownership." However he warned that Indonesia wanted to see a commitment from Australia to invest in the archipelago, saying that sometimes what the private sector wanted was different to what governments negotiated. For example, Mr Deddy said, the private sector indicated they were more interested in investing in vocational education - such as an animation course for example - than universities. Australia Indonesia Business Council president Phillip Turtle said he was hopeful the deal would make it easier for Australia to provide vocational education to meet Indonesia’s need for skills training. "There has been frustration on both sides that there hasn’t been the capacity to better bring together Australian and Indonesian VET (Vocational Education and Training) sectors," he said. "We don’t expect that this agreement will be the solution to all problems but we hope it will unlock a number of opportunities for people to take advantage of," Mr Turtle said. "We really want to make sure this agreement is seen to be balanced and doesn’t favour one particular country." Mr Deddy also said Australia wanted no geographical restrictions on where it could invest in healthcare in Indonesia, whereas Indonesia wanted to ensure a balance of services and facilities in the east and west of the country. Despite the proximity of the two countries, Indonesia is only Australia’s 14th largest trading partner, with 2 per cent of total trade. Meanwhile, Australia is Indonesia’s ninth largest partner, representing 2.8 per cent of total trade. 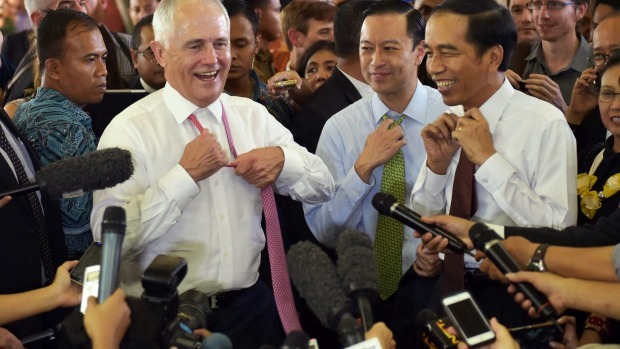 "It is difficult to find two G20 neighbours that trade and invest in each other as little as Australia and Indonesia do," Kyle Springer, a program manager from the Perth USAsia Centre wrote recently. In July the Centre organised for a group of Indonesian and Australian experts to examine the causes behind the "limping economic relations" and what might be done to fix them. In a report outlining their findings, they said that as two economies heavily dependent on natural resources Australia and Indonesia were actually competitors rather than collaborators and Australian companies found it difficult to navigate Indonesia’s business climate. The report said the free trade deal - known as the Indonesia-Australia Comprehensive Economic Partnership Agreement - should be completed by the end of the year as planned. "While negotiators should seek the highest quality agreement possible, they should not make the perfect the enemy of the good," it said.